Never have I read a Maureen Johnson book. Nope, never. I follow her on Twitter though and she's...err... a character. 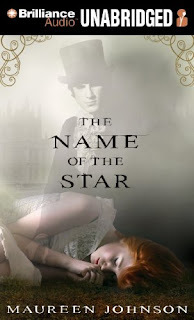 When I saw that her book The Name of the Star was available on my library's download site, I decided to give it a listen. Social media works, my friends, if you use it to entertain people not spam them. Rory is an American high school student attending her first year at a London boarding school. She's trying to get herself acclimated to not only a new school but a new country: getting a grip on the school system, manoeuvring the bathroom jungle every morning, making friends, and avoiding the Jack the Ripper style murderer. Yep, Jack is back. Rory's arrival coincides with the discovery of a serial killer. Not just any serial killer, one emulating London's most famous murderer with a twist, he seems to be invisible. When a body shows up at the school, Rory finds out she might be the only person who may have spotted him. Maybe even spoke to him. Strange, since her roommate didn't see him even though she was with her at the time. What does it mean? Is she in danger now? My first Maureen Johnson and I was quite pleased! Yes, it has a couple of young adult tropes I usually hate (missing parents, teens with inexplicable freedom) but I barely noticed. Johnson makes it all seems totally plausible. And thank goodness no maudlin navel gazing. Rory doesn't get all "Woe is me! Why?! Why?!" Her new abilities come as a shock but she knows she can do some good with them. Rory and Co. are characters I enjoyed reading about. Rory is charming and brave. Boo is hilarious and I have a soft spot for Callum. Stephen is someone I think we'll get to know better as the series progresses. Yes, this is a series but we aren't left hanging at the end. The reader gets closure while at the same time a hint of what is to come. So, I tip my giant silk top hat to Maureen Johnson. Well done, Madam, well done. About the Audio: Nicola Barber did an amazing job. Before I read her bio, I had no idea she was British. That explains how perfectly she does the British characters and how different each accent sounds. I especially loved Callum's. Rory's Southern drawl is fantastic too. I would listen to her read other books in a heartbeat. I have heard great things about this book and this author, so I definitely want to read this. I've never read Johnson either, but it sounds like I need to. I love audios that motivate me like that! I've never read her either, but she keeps appearing on my radar lately. Are her books meant to go on my Christmas list I wonder? This one sounds great! 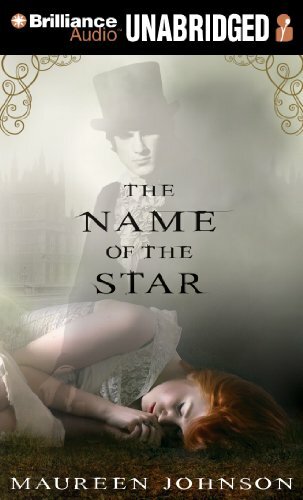 Nicola Barber is a new-to-me narrator and I'm eager to hear her work! I am going to have to jump on the Maureen Johnson bandwagon. This sounds really good. I'm interested in learning more about the narrator, too! Thanks for the review! I *really* need to finally read one of her novels. I absolutely adore her on Twitter. I can only imagine how hilarious her characters are given her sense of humor. I really hate that this is part of a series because I was all wanting to read it before I found that out! I'm always a bit iffy about YA to begin with, but add the fact that it's first in a series and that almost kills it for me. Almost. We'll see. People keep saying it's really good.